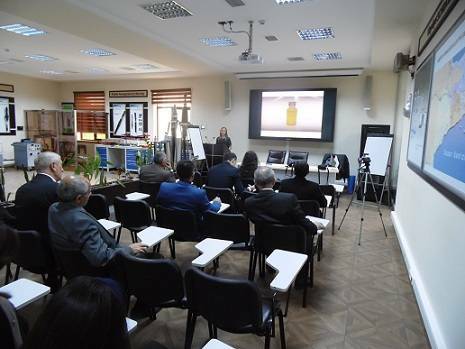 From 12 to 16 October 2015, presentations and demonstrations of GlobeCore products were held in Baku and Gyandzha. The events were attended by members of the electric power industry of Azerbaijan. GlobeCore managers revisited GlobeCore’s history and described the equipment designed for the processing of dielectric insulating oils and the servicing of electric power transformers. GlobeCore equipment can restore used petroleum products to a like new condition for continued use. This approach is the most cost effective way to extend the service life of oil and equipment as it preserves precious resources and protects the environment. GlobeCore equipment used for transformer oil purification and regeneration, as well as for transformer servicing, saves money and reduces the need to buy replacement oil and eliminates the need to dispose of used oil. The reliability of oil filled electrical equipment is greatly improved and the service life of the oil and the equipment is extended for many additional years. The participants at the presentations posed many questions for the GlobeCore representatives. None were left unanswered by GlobeCore’s engineer who provided insight and advice on maintaining and extending the service life of oil filled equipment. In accordance with tradition, the presentations were concluded with a practical demonstration using a GlobeCore UVR type demo unit. Everyone in attendance was able to observe how used transformer oil is restored to a new like condition. GlobeCore would like to thank our colleagues from Azerbaijan for the opportunity to present our equipment and exchange ideas and experiences with the hope of fruitful cooperation in the future.